React shortcode generator can be accessed when editing / adding any page, post or portfolio item. You can even add shortcodes via the React shortcode widget, which will allow you to add shortcodes into any widget area. Whenever you see the shortcode button (on left) you can click it to launch the shortcode generator. Use the dropdown menu or click a Popular shortcode to generate the options. Each shortcode options has a description and tool tip help where necessary. Go through all the options with your preferences and then Insert into the page. Edit the shortcode at any time by selecting it then copy it. 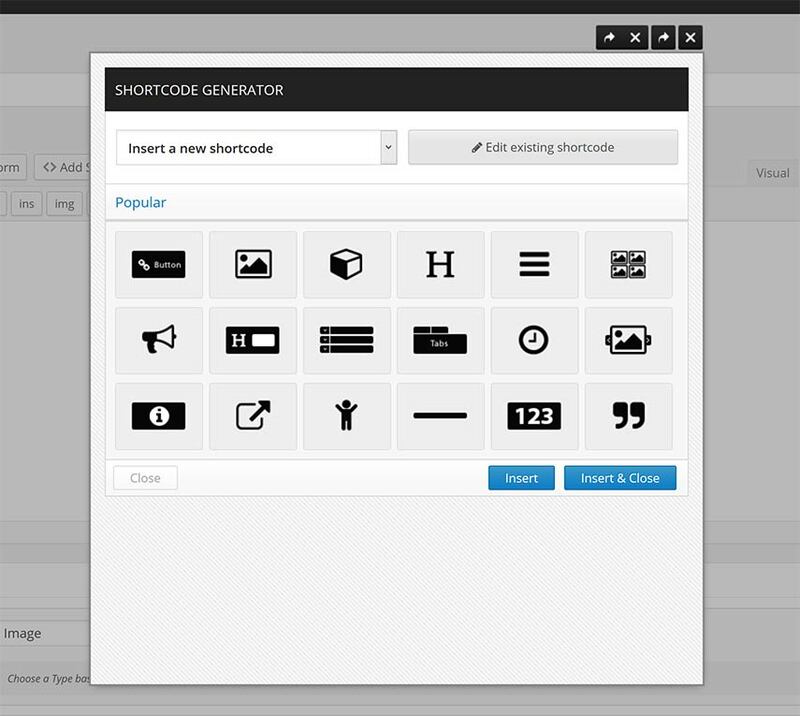 Open the Shortcode Generator and press Edit existing Shortcode, paste in the code and Edit. hide-large Hides on larger screens. hide-mobiles Hides on phones and tablets. phone-text-center switch text alignment to center on phones. tablet-text-center switch text alignment to center on tablets. mobile-text-center switch text alignment to center on phones and tablets. phone-text-right switch text alignment to right on phones. tablet-text-right switch text alignment to right on tablets. mobile-text-right switch text alignment to right on phones and tablets. phone-text-left switch text alignment to left on phones. tablet-text-left switch text alignment to left on tablets. mobile-text-left switch text alignment to left on phones and tablets. phone-box-center Move an elements alignment to center on phones. Works only if a width is set. tablet-box-center Move an elements alignment to center on tablets. Works only if a width is set. mobile-box-center Move an elements alignment to center on phones and tablets. Works only if a width is set. phone-box-right Move an elements alignment to right on phones. tablet-box-right Move an elements alignment to right on tablets. mobile-box-right Move an elements alignment to right on phones and tablets. phone-box-left Move an elements alignment to left on phones. tablet-box-left Move an elements alignment to left on tablet. mobile-box-left Move an elements alignment to left on phones and tablet. highlighted-text Adds the primary colors as a background to highlight text. text-alt Makes the text color the Alt text color. text-prime Makes the text color the Primary color. subtle-link Add links to give it an colored underline. phone-text-center Makes text-align center on phones. phone-text-left Makes text-align left on phones. phone-text-right Makes text-align right on phones. tablet-text-center Makes text-align only on tablets. tablet-text-left Makes text-align left only on tablets. tablet-text-right Makes text-align right only on tablets. mobile-text-center Makes text-align only on tablets and phones. mobile-text-left Makes text-align left on tablets and phones. mobile-text-right Makes text-align right on tablets and phones. fw-100 Makes the font-weight 100.
fw-200 Makes the font-weight 200.
fw-300 Makes the font-weight 300.
fw-400 Makes the font-weight 400.
fw-500 Makes the font-weight 500.
fw-600 Makes the font-weight 600.
fw-700 Makes the font-weight 700.
fw-800 Makes the font-weight 800.
fw-900 Makes the font-weight 900.
bold Makes the bold text. underline Gives the font an underline. italic Makes the font italic. breakword Will break words if it doesn’t fit within the container. big For H tags only. Overrides the default font sizes to make it a little bigger. bigger For H tags only. Overrides the default font size to make it much bigger. subtle-link For A tags only. Makes a styled underlined hyperlink. popup-link For A tags only. Makes the link open in a new window. react-smooth-scroll For A tags only. Makes the link scroll to an anchor link smoothly.